This recipe comes courtesy of Nigel Slater’s book, Real Food. The original recipe calls for 75g of butter, which I thought would be excessive, so I used 50g. I should’ve listened to Nigel – the mushrooms really soak up the butter. They were incredibly flavourful though and I tweaked the recipe a bit by adding a drizzle of truffle oil when they came out of the oven. This would be a great way to prepare mushrooms for a risotto. Preheat the oven to 200C. Put the garlic cloves in a small saucepan and cover with water. Bring to the boil, the drain and return to the saucepan with more cold water and bring the boil again. Once boiling lower heat and simmer for 5 minutes then drain. 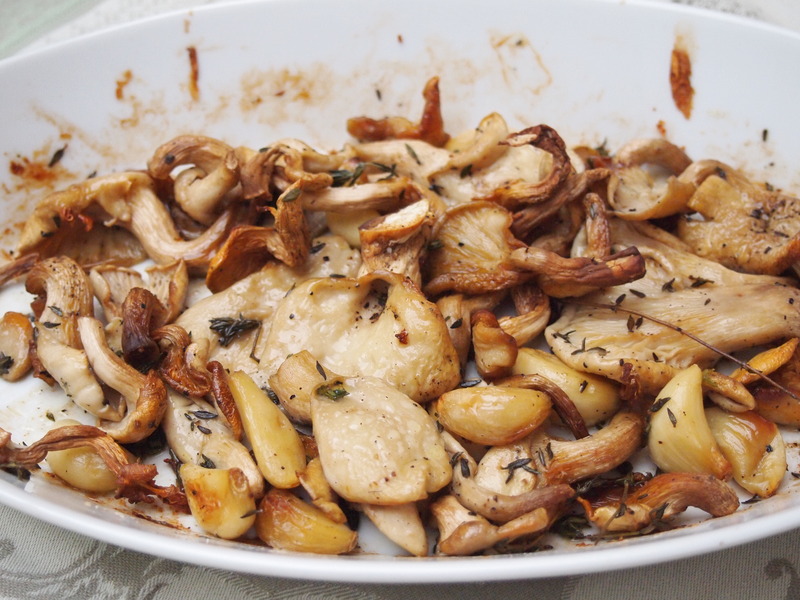 Spread the mushrooms in an oven proof dish that will hold them snuggly. Nestle the garlic cloves in and around the mushrooms. Dot with butter and sprinkle over the thyme leaves. Season with salt and pepper. 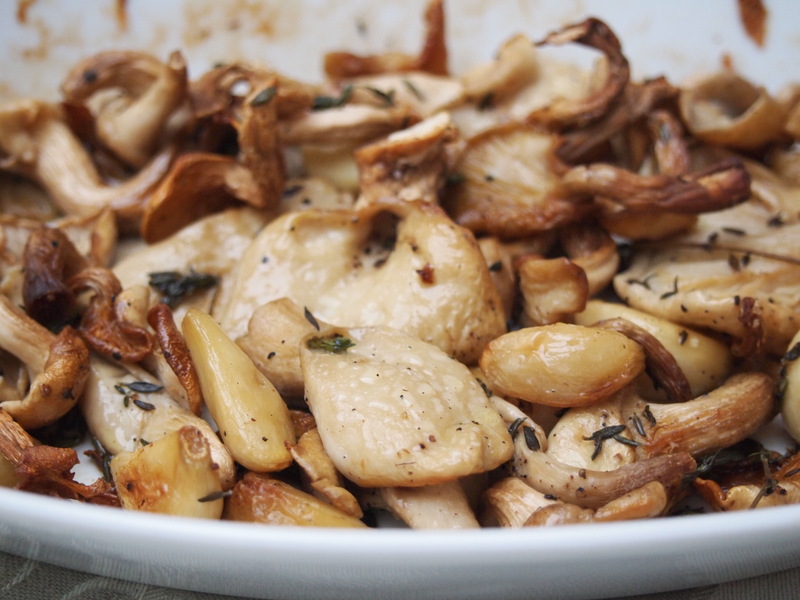 Place into the oven and bake for 20 – 25 minutes until the mushrooms are golden. 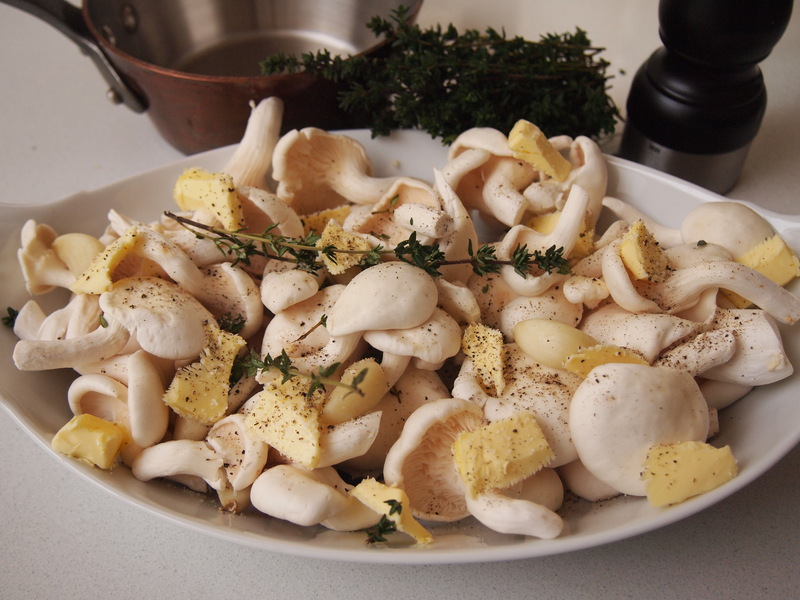 During the cooking time frequently baste the mushrooms with the butter in the pan to avoid them drying out.